Much is made in horticultural circles of ‘the end of the season’ – which generally means the garden centres are stocking up with Christmas decorations. If you’re new to vegetable gardening and planning a veggie plot – but feel it might be all too much hard work – fear not: the key to success is in the design. It’s easy for newbies to get carried away on a fit of enthusiasm, intent on being self-sufficient and growing fresh, healthy veg for the family all year round. Stop! This way leads to overwhelm, trying to grow too much, too soon, when weeds and the weather and work will erode your good intentions and leave the plot neglected or worse – abandoned. 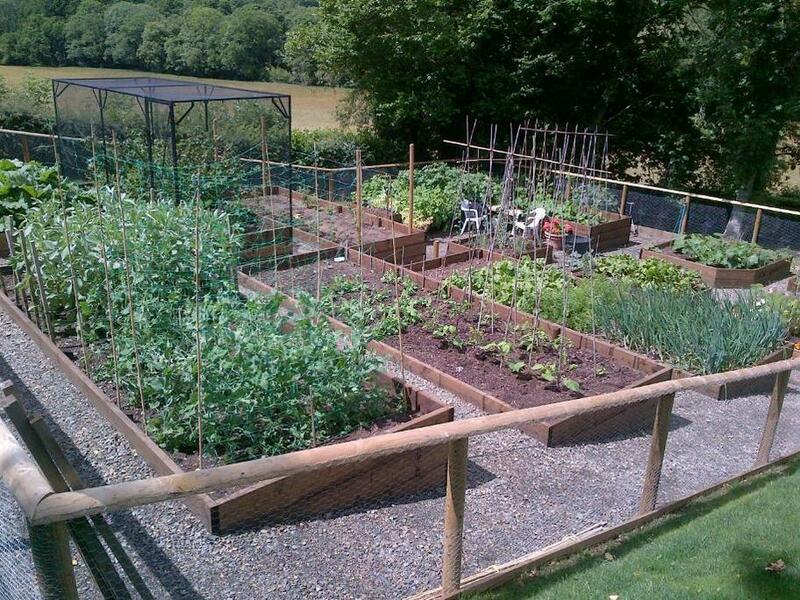 I design an increasing number of vegetable or kitchen garden for my clients in Devon, as the trend for home grown veg and healthy living blooms. Increasingly the vegetable plot takes on a more central role in the greater garden scheme, rather than being relegated to a scruffy plot at the bottom of the garden with the compost bins and the ‘dumping ground’. And I always include a seating area within the veg plot – after all, this is where you’ll be busiest and a rest most needed! 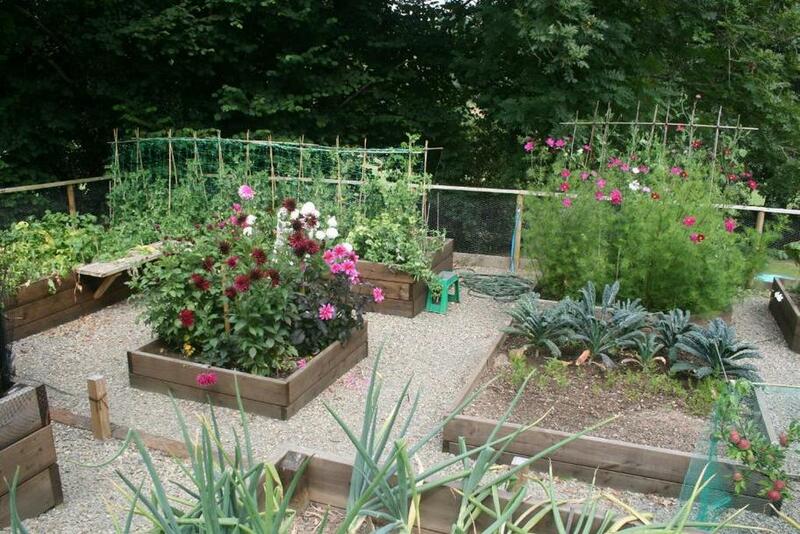 Vegetable gardens can be beautiful as well as useful – prerequisites for good design. Firstly accept you won’t be able to grow everything – it’s unlikely you will have the time, space or a suitable soil for everything on your wish list. The next most obvious question is: What do you want to eat? Don’t waste time, space and energy growing things that are cheap and plentiful in the shops such as main crop spuds or onions. Better to grow unusual varieties of new potatoes or shallots – easy to grow but pricey and less available. This also includes Asparagus and soft fruit- expensive to buy and as with so much home grown produce, delicious when fresh from the garden. Once you’ve compiled a list of crops you’d like to try, cut it down to the essentials – don’t let beginner enthusiasm run away with you; there’s always next year! To start, try three crops grown from seed and establish a couple of permanent crops – for example, new potatoes, French beans, a ‘cut and come again’ lettuce mix, and permanent crops such as Rhubarb with some soft fruit like gooseberries or currants. Next consider your space – be realistic about how much room you have and note where the sunny and shady spots are in the garden. Is it exposed or sheltered? Is there an obvious spot at the bottom of the garden or would it be more practical to have it much closer to the kitchen door? Most important is your soil – is it heavy, sticky clay or a gritty, crumbly loam? These factors will effect what you can grow well – but most soil problems can be resolved or at least improved. Next consider the layout. Before you site your beds and growing areas consider other practicalities such as a greenhouse for propagating seedlings, a shed for storage, a compost heap - or three - and a utility area for storing bulky items like grass clippings, leaf mould and bags of compost. You may not want all these things as space - or lack of it, is an issue, though if I were to pick one, a compost heap would be favourite. Now consider where to site all these things. 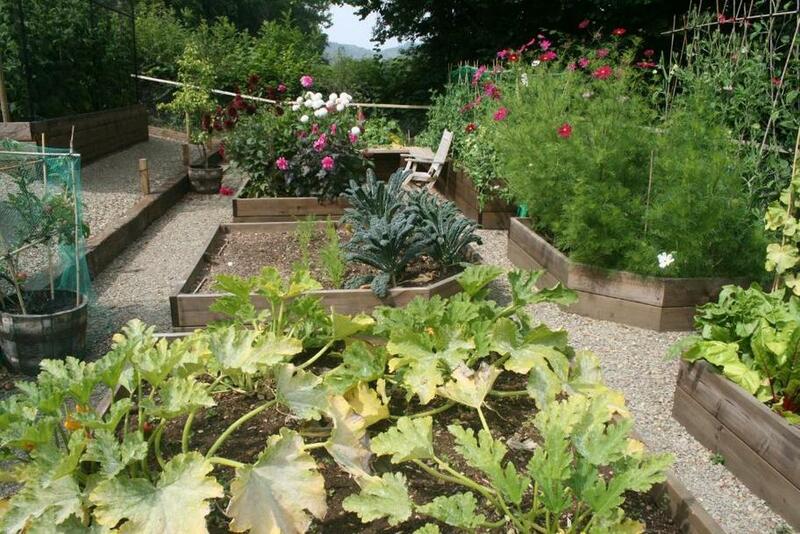 The sunny areas are good for fruiting veg –courgettes, outdoor tomatoes, beans – as well as onions. Shadier sites will suit leafy crops like lettuces, cabbages, root crops and surprisingly, soft fruit. Gooseberries and currants are generally woodland plants and will cope well in at least partial shade. And the beds themselves - are these to be raised beds or open ground? Raised beds create more manageable growing space where the soil drains and warms up better, plus you can control the type of soil put in them, if your own ground is hard work. An area of open ground is useful too, for permanent or long term crops that mop up space such as Rhubarb or sprouting broccoli. 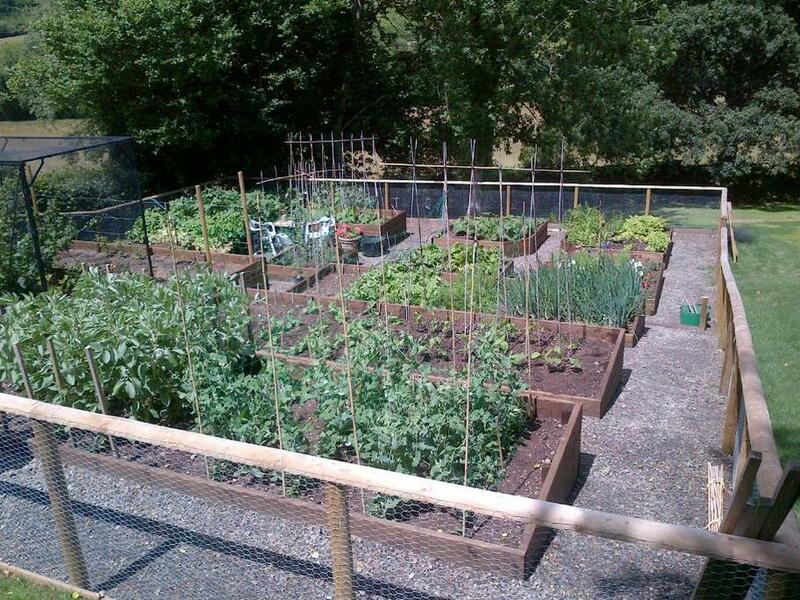 Three raised beds would probably be enough for one household with the option of being able to put a rotation system into practice. In a very small plot it probably isn’t worth worrying about however, and you will find crops grown hugger mugger with each other grow quite happily and confuse the pests! Be generous with paths around the beds; most of my veg gardens are half growing area, half path – but this is not wasteful. A path needs to accommodate a wheelbarrow and the use of larger garden tools so plenty of space around beds makes working the garden more manageable – plus it looks good and you won’t feel overwhelmed with the abundant growth in summer. Suitable surfaces for paths include bound gravel - a fine compacted substrate that drains and copes well with wheelbarrows. Recycled crushed concrete is also a cheaper option. Less attractive features such as sheds and compost heaps could be screened off, and the screen itself used to support tayberries, espalier fruit trees or climbers such as beans. And don’t forget a sitting area from which to contemplate your labours – a Sitting Spiritually swing seat is ideal here – you’ll appreciate the rest! You may also want to consider a simple pergola or archway over the seat to train fruit trees or cordons. And the bees will thank you for a nearby bed with herbs and cut flowers - and repay you by pollinating your fruit and veg! Lastly, there is a cornucopia of information about vegetable growing in countless books and via the internet – more ‘overwhelm’! Call me old fashioned but I suggest you select about two well illustrated books that inspire you and you will actually enjoy reading – in your swing seat of course! -and use the internet to research specific crops as a backup. To see my Facebook and Twitter pages, please click the buttons below.